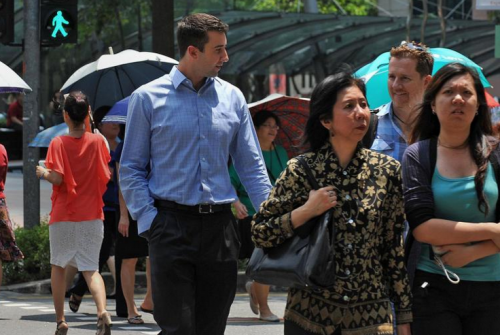 Foreigners working in Singapore are going to find it harder to bring their families over. The Ministry of Manpower (MOM) is raising the minimum salary bar before they can apply for visas for spouses, children and parents. From Sept 1, they will have to earn at least $5,000 a month if they want to apply for Dependant's Passes (DPs) for their spouses and children to join them in Singapore. This is up from the current $4,000. Those who want to bring their parents to Singapore on Long Term Visit Passes (LTVPs) face an even higher minimum salary bar of $10,000 a month, up from $8,000. The changes, which were updated on the MOM's website in the last week, come after the ministry said employers looking to hire foreign professionals will face tougher rules from Oct 1. "The Government updates the DP/LTVP qualifying salary from time to time, to ensure that sponsors will be able to upkeep their dependants," an MOM spokesman said yesterday. "We continue to welcome highly skilled foreign professionals who wish to bring their dependants to stay with them." The move will affect foreigners on S Passes and Employment Passes (EPs). According to the MOM's website, there were 178,900 people on EPs and 170,100 on S Passes as of December last year. The minimum salaries for foreigners bringing in their families were last adjusted in 2012. Before that, S Pass holders who earned more than $2,800 and EP holders could bring in their spouses and children. Ms Cai Bi Xia, general secretary of the Huayuan Association which helps Chinese nationals settle into Singapore, said the move signals that the Government wants to attract foreigners of a certain calibre. It will put pressure on firms to raise salaries to attract this group, which is also sought after by other countries. "Companies need to recognise the higher salary requirement and raise pay accordingly to attract the talent they want," she said. Mr David Leong, managing director of recruitment firm PeopleWorldwide Consulting, noted that raising the minimum salary will ensure that foreigners can support their families here. But he warned that the move may make Singapore less attractive to foreigners in the long run. "When senior managers relocate to another country, they would want to bring their family," said Mr Leong. "(The change) will make people who are moving to Singapore think twice about doing so. "It discourages them from bringing their families and sends a signal to come alone, which may make other countries more attractive." Singapore Management University law don Eugene Tan said: "It is a necessary rationalisation as hiring one foreign professional can open the door to, say, four others in his or her family, which can impose a cost on society. By reviewing the benchmark, the door remains open but there is a more judicious management of the inflow." Accountant Benjamin Ang, 32, said: "I hope that this means there are more chances for promotion. With the changes, foreign professionals might be discouraged from coming here to work. "This could be an opportunity for locals to work harder and excel."